In spy movies, someone always has a cool gadget like a pen that takes secret pictures of classified documents. 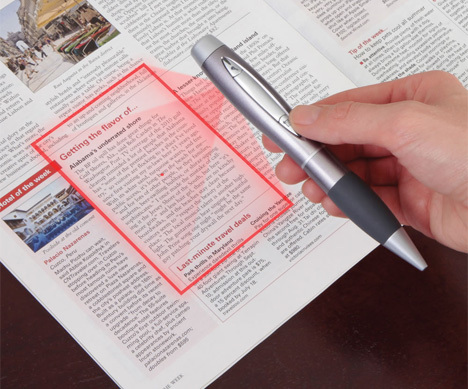 The same technology is now available to regular people in the form of the Pen Sized Scanner from Hammacher Schlemmer. 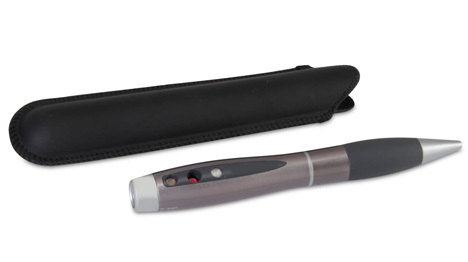 The $125 gadget is a working ballpoint pen, but with a twist of a dial it switches functions to a covert scanner. When you want to catch a sneaky picture of a document or other piece of information, you just press the shutter button halfway down to project a cool laser frame onto the target. Press the button the rest of the way and the five-megapixel camera snaps the image, which is then stored on the 1GB internal memory. An internal USB plug is revealed when you twist the pen apart, allowing for direct downloading to your computer and, presumably, letting you email secrets to your CIA handler. See more in Camera & Video or under Gadgets. February, 2013.